Recently we were fortunate enough to be a participant in the Modular Building Institute’s annual meeting they call the World of Modular held in mid-March in Scottsdale, AZ. It was good to meet with over 540 of our colleagues working in the Modular building industry from across the US, Canada, Mexico Europe and China. We shared many ideas and took away several new bits of wisdom. While there, our Director for Construction Services, Dave Parlo and I gave a presentation about our winning entry – MyMicro NY – in the NY HPD RFP contest to design and build micro apartments in lower Manhattan. This project has generated a lot of industry buzz and we were proud to share with our colleagues a little about that project and about how well received Modular Construction is in New York these days. At this conference, MBI unveiled several willing entries in their annual search for innovative ways to use modular construction to solve specific project parameters. We thought you might like to see some of these winning entries. The like below is to an article placed by our friends a Building Design + Construction at their website. Enjoy. The folks at Australia’s DesignBuildSource.com – a leading source for industry information Down Under published the following. And we’d like to thank them for their recognition and agree with them. We have been seeing a lot of interest in our industry in the NYC area lately as the following illustrates. 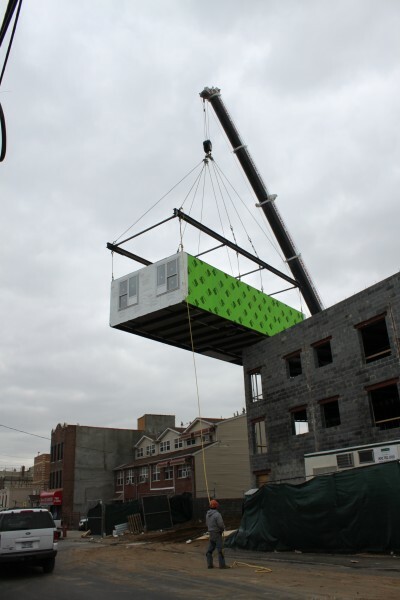 The use of modular construction is becoming increasingly popular in New York City due to changes in public perception and greater enthusiasm for the practice amongst members of the building industry. While New Yorkers have traditionally been averse to living in buildings fashioned from pre-fabricated parts due to the enduring association of such materials with cheap, low-end housing, its embrace by members at the upper end of the construction industry has engendered a sea change in attitudes. New York City’s inaugural micro-unit apartment building design contest recognized an entry by Monadnock Development LLC, Actors Fund Housing Development Corporation and nARCHITECTS. 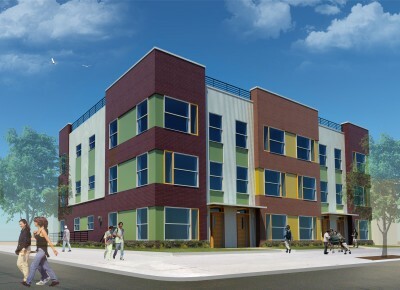 Their winning project is set be the first multi-unit building to make use of modular construction. The project, entitled My Micro NY, will see the construction of 55 micro-apartments on a site at 335 East 27th street in Manhattan, and is expected to be ready for occupancy by September 2015. Towards the end of last year, Forest City Ratner also announced that it would use modular construction to build a residential tower at the Atlantic Yard development, situated in Brooklyn, as part of a major overhaul of the Atlantic Terminal Urban Renewal Area. 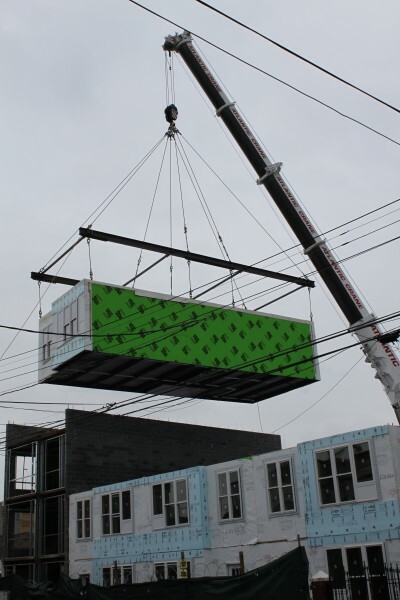 According to one leader in the design and construction industry, people are slowly warming to use of modular building practices. David J. Burney, the commissioner of the New York City Department of Design and Construction, told the New York Times that despite its traditional lack of status attitudes towards modular building are fundamentally shifting. 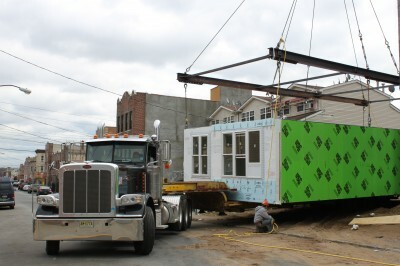 Developers have been among the first to embrace the potential of modular construction, with Capsys Corp, a manufacturer of steel-frame prefabricated buildings and modular homes based in New York, reporting that it receives “a dozen calls a week” from developers who are interested in what the new technology has to offer. DeLuxe Building Systems, a veteran in the field pre-fabricated construction, is also working on several projects in New York at present, including an 11-storey rental building in Harlem. The company is also is currently in negotiations with a developer for the construction of two 24-storey rental high rises. 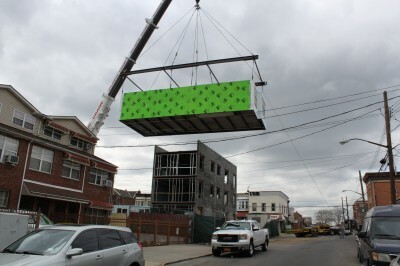 With interest in modular building in urban areas on the rise, the Modular Building Institute and Pratt School of Architecture will co-host a Modular Construction Summit in Brooklyn, New York on May 16, 2013, to help distinguish fact from fiction on this construction process. Do modular buildings last as long as stick built? Are they less expensive? Can they be as attractive as their traditionally built counterparts? While the answer to all of these questions is yes, the summit will provide an opportunity for people to find out exactly why this is the case – and get answers on many more issues. The event will feature two morning sessions with panels of high-profile architects and builders, as well as the Commissioner for the NYC Department of Design and Construction. In the afternoon, attendees can tour the factory of Capsys Corporation, the modular builder for the My Micro NY project — a 10-story Manhattan apartment building slated for occupancy in 2015. Tom Hanrahan, Dean of Pratt Institute School of Architecture, will moderate the first morning session: Permanent Modular Construction for Multi-family Applications. Confirmed speakers include James Garrison, sustainable design pioneer and architect with Garrison Architects; Ian Peter Atkins, BIM Application Manager for architecture firm Kohn Pedersen Fox Associates; and Tom O’Hara, Director of Business Development at Capsys Corporation. The second panel, moderated by Modular Building Institute Executive Director Tom Hardiman, will focus on Modular Solutions for Disaster Relief and Emergency Housing. The confirmed speakers are David Burney, Commissioner, NYC DCC; William Begley, Director, Modular Housing and Hotels, Sea Box Inc.; Douglas Cutler, architect with Douglas Cutler Architects; and Norman Hall, National Manager for Factory Built Structures, Simpson Strong Tie. Sponsored by Capsys Corporation and open to the general public, the event will take place at Pratt Institute, Higgins Hall Auditorium at 61 St. James Place in Brooklyn. Registration is $25 before May 10, and $35 thereafter. To register, please visit theMBI website. New York City needs more affordable housing and the Bloomberg Administration and the real estate industry are working towards ways of achieving that. Recently, Mayor Michael R. Bloomberg announced the winning bid to build a micro-unit apartment development. These new units-the size of a hotel room- will be part of an apartment tower built on city-owned land and would be the first in a wave of tiny apartments aimed at meeting the market need for more studio apartments. This PILOT project is intended to provide lower cost housing units that will enlarge the city’s inventory of housing and become a crucial aspect of new market rate projects in the future. In addition to micro-units, modular or pre-fabricated construction, which has been around for years, could also become an effective way to address the demand for affordable housing. 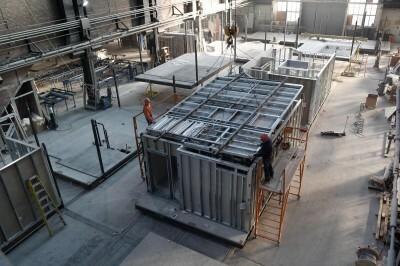 Building units in a quality-controlled, union run factory for most of the construction process will accelerate development, and increase safety which will make modular building an appealing alternative to conventional construction. 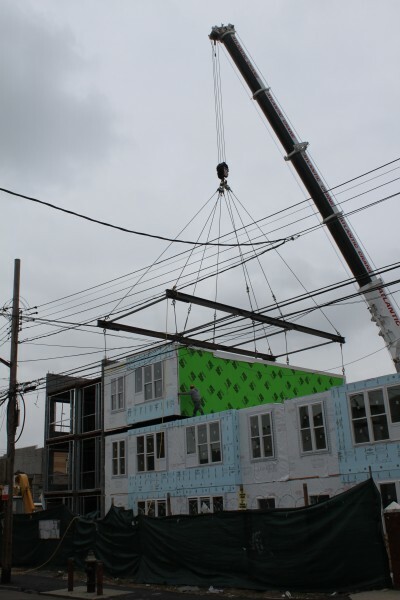 Modular construction is a process by which full sections of a building are built in a fabrication facility and then delivered to a project site where modules are erected and building systems are connected. Thus, construction work is split between the fabrication facility and the actual construction site. 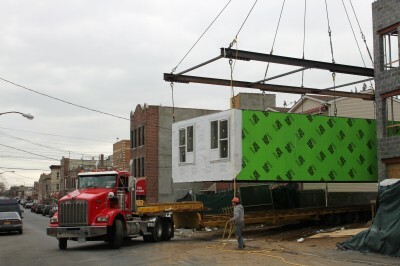 In the past, modular construction did not catch on in New York because it was not designed for multi-family housing which is dominant here and it was antithetical to union labor, which is part of the DNA of New York’s multi-housing construction industry. 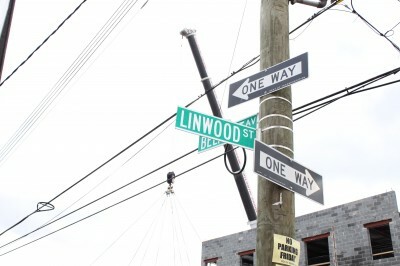 These issues were addressed by the Forest City Ratner Company (FCRC) who is using modular methods to build the first residential building at the $4.9 billion Atlantic Yards project in Brooklyn. 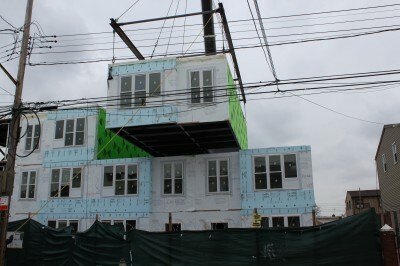 In January, the Real Estate Board of New York testified in favor of modular building and FCRC’s project at a NYC Council Oversight Hearing on the Future of Prefabricated Construction Practices. FCRC, a REBNY member, has worked tirelessly to adapt this method of construction for the type of multi-family housing that is commonplace in neighborhoods across our city and worked with our colleagues in unionized labor to keep the production of this housing both local and union. REBNY applauds these accomplishments. 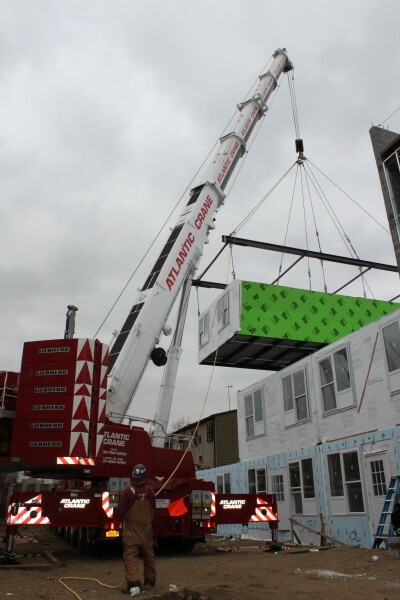 Other benefits of modular construction includes less impacts on the surrounding community; reduced traffic with fewer truck trips to and from the construction site since much of the construction is done elsewhere; and 70-90 percent less waste, according to estimates. FCRC’s project holds the potential for more significant long-term benefits. It could generate demand city-wide and throughout the region for more modular housing. If so, then the 125 union workers at the Brooklyn Navy Yard associated with the FCRC project will only be the beginning. Modular housing and micro-units can be an important and effective way to address our city’s chronic shortage of affordable housing by bringing the cost of new housing to a level that more New Yorkers can afford. Three Story Building Erected in Just One Day! The Linwood Street building, which is one out of three buildings of our Cypress Village project, was erected in just one day! Joined by the owner and architect plus the local neighborhood residents, I watched in amazement as the building was set in place so quickly. 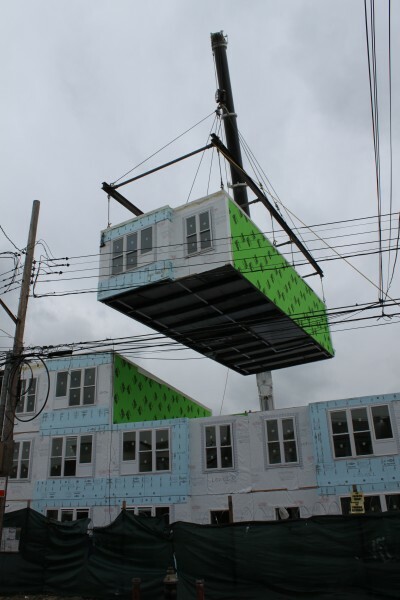 This is just another example of the many important benefits of modular construction. This rendering is of our next project, Cypress Village. Magnusson Architecture and Planning designed this beautiful building. Cypress Village is being built by Capsys for the Cypress Hills Local Development Corporation. 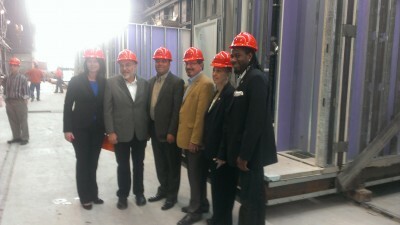 This project will contain two buildings – one on Linwood Ave. and one at Jerome Street both in Cypress Hills, Brooklyn. It will contain eighteen, two bedroom apartment flats. Each 940 SF flat is wholly contained within one 20 foot wide by 47 foot long module – the largest we have ever constructed We’ll post erection photos soon so you can see these big guys flying into position. It should be quite a show.